“Bachat Lamp Yojana” was a launched in 2009 to reduce the cost of compact fluorescent lamps (CFLs, i.e., energy saving lights) sold to consumers. Implemented through the Bureau of Energy Efficiency (BEE) in India’s Ministry of Power, the program’s goal was to deliver CFLs at the cost of normal lightbulbs. The difference in cost will be covered by the sale of Certified Emission Reduction(CER) Units (Carbon Credits) under the Clean Development Mechanism of the Kyoto Protocol. The Ministry of New and Renewable Energy stopped the subsidy on CFL-based solar lighting system to encourage the use of the LED version. DELP replaced the ‘Bachat Lamp Yojana’ [Energy Efficient Lighting Programme (EELP)] – Scheme to offer CFL at the price of Incandescent bulbs. DELP encourages the people to use LED bulbs in place of incandescent bulbs, tube lights and CFL bulbs. DELP sold 9 crore LED bulbs at subsidized prices reducing the energy cost by 50 billion rupees. 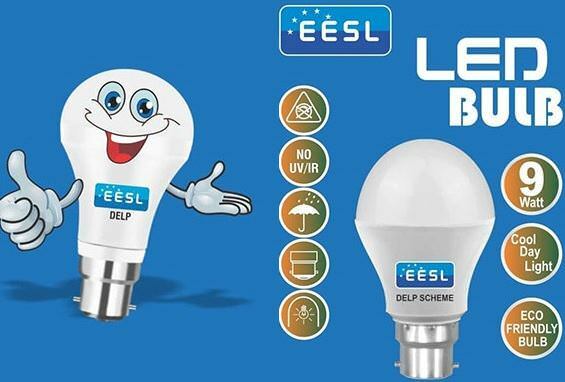 DELP scheme is implemented by Energy Efficiency Services Limited (EESL) – Ministry of Power. EESL is a Joint Venture company of four Central Power Sector undertakings viz. NTPC Ltd, PFC, REC, and Power Grid. EESL was set up to create and sustain markets for energy efficiency in the country. EESL works closely with the Bureau of Energy Efficiency (BEE). It is leading the market related activities of the National Mission for Enhanced Energy Efficiency (NMEEE), one of the 8 national missions under National Action Plan on climate change. In an incandescent light bulb, a wire filament (tungsten) is heated to a high temperature by passing an electric current through it until it glows with visible light. 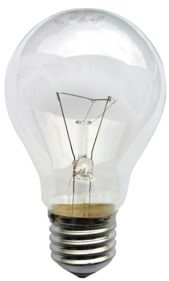 The hot filament is protected from oxidation with a glass or quartz bulb that is filled with inert gas. Pure tungsten has very high melting point (3400 °C) [An electric current can heat the filament around 2000-3000 °C, which stays below the melting point of tungsten]. It has very low vapor pressure, and greatest tensile strength out of all the metals. 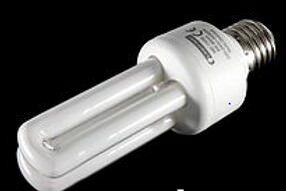 Compact fluorescent lamp is a fluorescent lamp designed to replace tungsten lamp. Compared to incandescent lamps, CFLs are highly energy efficient. Like all fluorescent lamps, CFLs contain toxic mercury. A fluorescent lamp is a low pressure mercury-vapor gas-discharge lamp. Electrons that are bound to mercury atoms are excited to states where they will radiate ultraviolet light as they return to a lower energy level. This emitted ultraviolet light is converted into visible light as it strikes the fluorescent coating on the bulb (phosphor coating). An LED lamp is a light-emitting diode (LED) product which is assembled into a lamp. LED lamps have a lifespan and electrical efficiency which are several times longer than incandescent lamps, and significantly more efficient than most fluorescent lamps. It is a p–n junction diode, which emits light when activated. When a suitable voltage is applied to the leads, electrons are able to recombine with electron holes within the device, releasing energy in the form of photons. This effect is called electroluminescence, and the color of the light corresponds to the energy of the photon. (The bulbs don’t emit CO2. Source: http://goo.gl/255fPE and Delp Scheme. A transistor is a semiconductor device. It forms the basic component of all electronic devices. It is used to amplify or switch electronic signals and electrical power. IGBT replaces analogue power control with digital power control with a massive increase in efficiency. A CFL lamp needs a switch. IGBT plays the role of a switch in a CFL. IGBTs is also used to generate the (mercury) gas discharge, which lights up the bulb. The IGBT’s other advantage is that it can fit in a small volume. IGBT are also used in electronic components of various household appliances ranging from space heaters to refrigerators. They are also used in medical products (X-ray, CAT, MRI). Inventor of the insulated gate bipolar transistor (IGBT). Alumnus of Indian Institute of Technology, Madras. 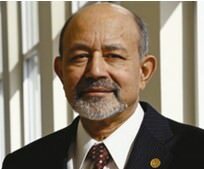 He won the global energy prize in 2015.